This superb hilt is made entirely from nephrite jade. Of fine proportions, it has been carefully worked to offer recessed panels, a facetted grip-bulb and an upturned disc pommel completed by a bud finial. Carved lines accentuate these features, orbiting the domed quillons and the pommel, and running across and around the quillon block. The hilt has also been set with flowers made of large rubies and emeralds using the kundan technique. This highly skilled way of setting precious stones is historically associated with the Mughal emperors and allows the jeweller to adhere gems to non-metallic surfaces through the repeated applications and shaping of pure leaves of 24-carat gold. An emerald-centred flower displays its four ruby petals from the centre of the quillon block while another ruby blooms surrounded by gold petals from within a teardrop-shaped niche in the grip. A third flower, again with an emerald centre and ruby petals, has been rendered as if upturned towards a pommel whose shape and translucency so easily fills it with sunlight. This beautiful and important sword hilt must have been owned by a man of great wealth and position. 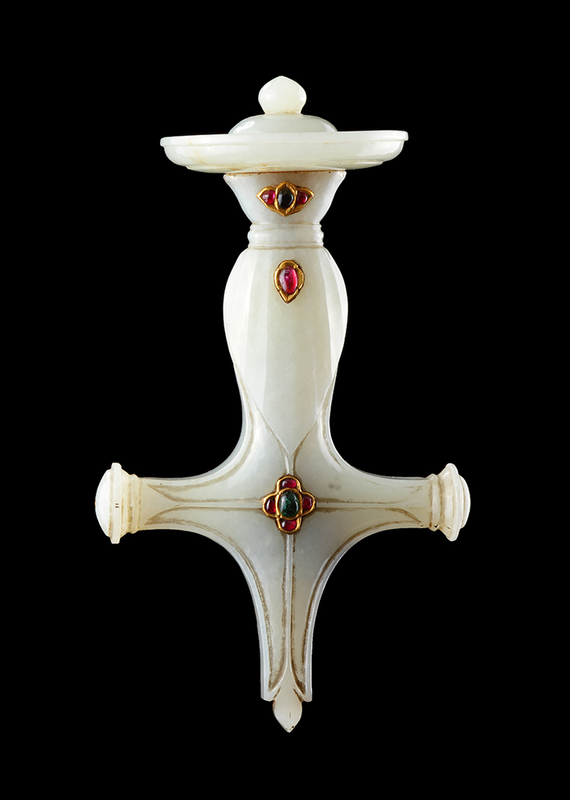 Mughal rulers gave weapons as gifts to their most important allies and, as such, the Rajputs were often recipients of exemplary items like this jade hilt. It would have been awarded in a formal ceremony, some aspects of which survive into today’s Indian customs and ceremonies. A similar hilt can be found in Kaoukji’s Precious Indian Weapons and other Princely Accoutrements. M. Athar Ali, The Mughal Nobility under Aurangzeb, OUP India, 1996, p.142. S. Kaoukji, Precious Indian Weapons and other Princely Accoutrements (the al-Sabah Collection), Thames and Hudson Ltd, 2017, p.314.